When I was a kid I used to love watching movies like the Karate kid. You know, where the hero starts off as average and then is then trained by a master. With loads of montage scenes of the hero running ever faster, lifting heavier and heavier weights. By the end of the movie the hero has gone from ordinary to amazing. I have been to Mallorca on loads of occasions but only done Sa Colobra twice. However I became slightly obsessed by it. I then decided to set myself the arbitrary target of climbing it in under 30 minutes. 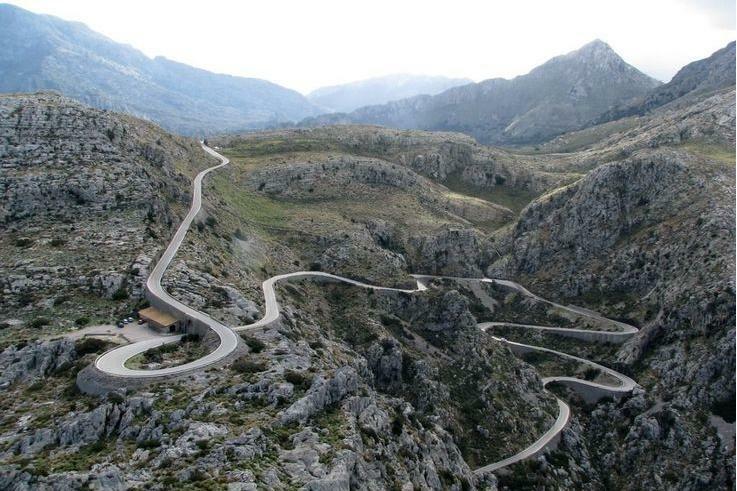 Sa Calobra is one of the world's iconic climbs. Its 9.4km at 7%. It's a pretty uniform gradient and has a lovely road surface. The views (if you have time to look) are amazing as the road snakes down to the sea. It was built in 1932 and was done as a tourist attraction; lets build this amazing road down to the sea. There was no economic rationale. What complicates matters is I am also doing an Ironman in August. That will require a lot of running, which clearly I would not do if I was purely focused on this. Am I getting my excuses in early? Will there be some cross training benefits? The fastest Strava time is 24.59 by David Lopez of Team Sky. Lots of pros are around the 26 minute mark. I have only done Sa Calobra twice. My best time was 33.56 mins at an average power of 322 watts. At 75 kgs that's 4.3 w/kg. That was in March of this year and was at the end of a weeks training camp. So I was in decent form but also slightly fatigued. But to take 4 minutes off of that seems ridiculous. On Strava that time places me 1579 out of 43844 (in the top 4%). However only 235 people have broken 30 mins; that's 0.5% of all the riders. We work out that to break 30 mins I will need to do 355-360 watts at my current weight. Gaining 30 watts over a summer is pretty hard to do at my age ! 360 watts at my weight is 4.8 w/kg. If you look at the Power Duration curve on Training Peaks they classify that as 'excellent'. Now I think I am reasonable on a bike, but even my mother would not claim I am 'excellent'. This is a big area, and I need specialist help so enlisted the help of Tony Purcell and his team at Performance Pro. We have done some talks with the Performance Pro crew before and they have a fabulous reputation for raising athletic performance. Improving body composition; losing 2kgs is the same as gaining 10 watts. So over the next 12 weeks I am going to get beasted by Tony and his team and will report back. This is the fun area. Buy speed ! The climb is long enough that clever decisions will save you time. Getting the bike as light as possible will help; as will getting it aero. Quick tyres, aero helmet, ceramic bearings. All sorts of toys to investigate. Writing this blog has been quite intimidating. I think I have a pretty decent work ethic. I know how to suffer on a bike. But when you smack straight against your genetic limitations there is very little you can (legally) do. Last week we hosted our very first Bespoke Travel trip and we had a blast. Mallorca is a very special place indeed.